Here is the comparison between the latest Chinese smartphones named Vivo V9, Oppo F7 and Redmi Note 5 Pro. All these three smartphones are recently launched in India. Let’s start with comparing Camera first. Let's start with firstly launched Redmi Note 5 Pro smartphone which sports a 12MP + 5MP dual rear camera which takes pictures and captures the images like a DSLR effect. The Vivo V9 also comes with a higher 16MP + 5MP dual camera setup on the back, whereas the Oppo F7 smartphone has only a single 16MP main camera while the dual rear camera is the trend which is disappointing to the Oppo fans. Coming to the front camera, the Redmi Note 5 Pro comes with a 20MP selfie shooter. As we all know that the Oppo and Vivo are the selfie experts, the Vivo V9 sports a 24MP front camera and the Oppo F7 comes with a large 25MP selfie camera. The Redmi Note 5 Pro smartphone is equipped with all-new Qualcomm Snapdragon 636 octa-core 1.8GHz Kryo 260 chipset processor. The Oppo F7 is powered by an octa-core MediaTek Helio P60 chipset processor, and the Vivo V9 smartphone features an octa-core 2.2GHz Qualcomm Snapdragon 626 processor. The Redmi Note 5 Pro has a high battery capacity of 4000mAh. The Vivo V9 sports a 3260mAh battery, whereas the Oppo F7 is equipped with a 3400mAh battery. The Redmi Note 5 Pro smartphone runs on Android 7.1.2 (Nougat) with MIUI OS and packs a 6GB RAM with 64GB internal storage. The Oppo F7 and the Vivo V9 smartphones run on Android 8.0 (Oreo) with the ColorOS and FunTouch respectively. Both the Vivo V9 and Oppo F7 smartphones offer 4GB RAM with 64GB storage memory. All the three mobiles can be expandable up to 256GB using a microSD card. The Redmi Note 5 Pro comes with a 5.99-inch 18:9 IPS LCD display which has a resolution of 1080×2160 pixels with Gorilla Glass protection. The Vivo V9 and the Oppo F7 features with a notch at the top like the iPhone X’s bezel-less design. The Vivo V9 has a 6.3-inch, and the Oppo F7 has a 6.23-inch display with 1080×2280 pixels resolution on both the smartphones. The Oppo F7 also protects the screen with Gorilla Glass. The Xiaomi Redmi Note 5 Pro was launched in February and is priced at Rs. 16,999 for its top variant. The Vivo V9 has launched a week ago and is priced at Rs. 22,990. The Oppo F7 was launched this month and is priced at Rs. 21,990 for its base variant. 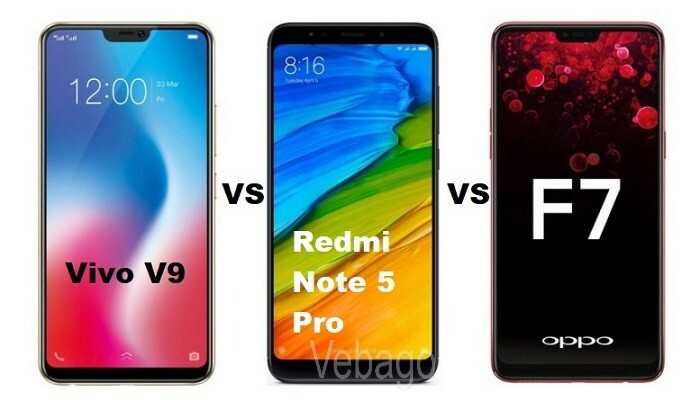 The Redmi Note 5 Pro is the best of the three which has the best camera, excellent battery life, superior processor and offers much more value for money.